NEW YORK, Oct 11 2016 (IPS) - Resistance towards the controversial Dakota Access pipeline continues after a federal court rejected requests to halt construction on Monday. Since August, members of the Standing Rock Sioux tribe and thousands of allies from across the North American nation have gathered in North Dakota to protest the 1,172 mile long pipeline. The $3.8 billion pipeline, undertaken by oil company Energy Transfer Partners and the United States Army Corps of Engineers, is to transport over half a million barrels of oil per day to Illinois. If built, it would be laid under multiple bodies of water including the Missouri River close to the Standing Rock Sioux tribe’s reservation. The project was met with widespread criticism as it would destroy sacred and culturally important landscapes. “[The pipeline] has absolutely no regard for our existence on this place…it has completely disregarded our burial sites, and our spiritual sites. It has disregarded all of those things that bind native people to the landscape,” artist and Sioux County native involved in #NoDAPL Cannupa Hanska Luger told IPS. Standing Rock Sioux tribe reported that several sacred sites including burial grounds and places of prayer have already been destroyed. “[The pipeline] has completely disregarded our burial sites, and our spiritual sites. It has disregarded all of those things that bind native people to the landscape,” -- Cannupa Hanska Luger. The pipeline also poses a great risk of contaminating the tribe’s main source of water. Luger stressed the necessity of clean water, especially for an area that relies on agriculture. “We actually have alternatives to oil. We don’t, as a living being on this planet, have an alternative to water. Once the last river is poisoned, we’re done,” he told IPS, also noting that they are “water protectors” rather than protesters. According to federal data, pipeline spills are a daily occurrence. Between 2010 and 2013, there were almost 2000 incidents of leaks, amounting to an average of 1.6 incidents per day. Despite these risks, critics say that plans for the pipeline were fast tracked, as the U.S. Corps of Engineers did not adequately assess the potential for oil spills or its impact on the environment. In response, the agency said that a more rigorous environmental assessment would have been conducted if the initial evaluation showed any significant environmental effects. However, the Army Corps noted negative consequences after rejecting a prior route from Bismarck, the state capital of North Dakota, citing potential contamination of the state capital’s water source. “What they did is they went backdoor and went straight to tribal lands…which is always the fallback for any major construction project that has to do with fossil fuel extraction,” Red Warrior Camp organiser Krystal Two Bulls told IPS. Red Warrior Camp is one of the main camps established along the Missouri River to protect the land from construction. The 1,179 mile Keystone XL pipeline was poised to transport an increased supply of oil from Canada to the U.S. While the U.S. State Department said that the project would not impact the environment significantly, the agency also expressed the need to find alternative routes to avoid impacting the “environmentally sensitive area” of Sand Hills. After six years of reviews, President Obama finally rejected the plan in 2015, citing concerns of environmental protection and climate change. “America is now a global leader when it comes to taking serious action to fight climate change. And frankly, approving this project would have undercut that global leadership,” he stated. The issue of the controversial pipeline also reached the halls of the United Nations, prompting Special Rapporteur on the rights of indigenous peoples Victoria Tauli-Corpuz to call on the U.S. government to halt construction of the pipeline and to consult with indigenous groups who were denied access to information and excluded from the planning processes. “The United States should, in accordance with its commitment to implement the Declaration on the rights on indigenous peoples, consult with the affected communities in good faith and ensure their free, and informed consent prior to the approval of any project affecting their lands, particularly in connection with extractive resource industries,” she stated. Prior to Tauli-Corpuz’s statement, the Department of Justice, the Department of Army and the Department of the Interior made a joint statement to temporarily halt construction while the government reviews its previous decisions and to hold formal consultations with tribes. 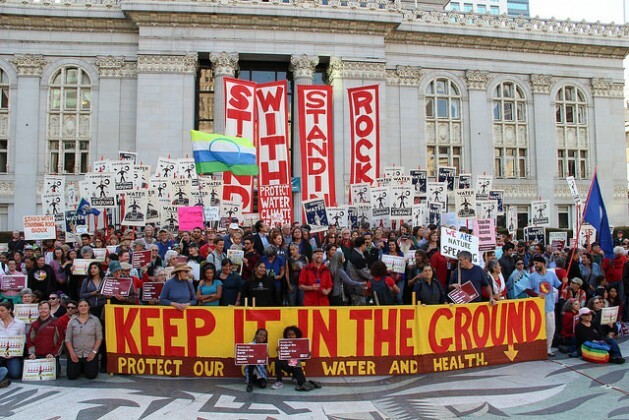 On Sunday, the U.S. Court of Appeals for the District of Columbia Circuit reversed this ruling anddenied the Standing Rock Sioux Tribe’s injunction to stop construction of the pipeline. “We will not rest until our lands, people, waters and sacred places are permanently protected from this destructive pipeline,” he continued. Indigenous Environmental Network’s Native Energy and Climate Campaign Organiser Kandi Mossett told IPS that it has been an “emotional rollercoaster” but that the Energy Transfer Partners has yet to acquire a permit to build the pipeline under the river. “We’re here and we’re going to be here if they try to continue to build,” she said. However, observers have reported that the #NoDAPL movement is being met with militarised aggression and violence. Hill told IPS of the militarised presence by the camps, noting that there were cars without license plates and armed guards who would not say who their employer was. “You feel like you’re being watched constantly,” said Hill. Energy Transfer Partners did not immediately respond to IPS’ requests for comment. In a statement, the County Sheriff’s department said that it was protestors who became violent. “This was more like a riot than a protest. Individuals crossed onto private property and accosted private security officers with wooden posts and flag poles,” said Morton County Sheriff Kyle Kirchmeier. The Sheriff’s department is currently leading an investigation into the incident. Confrontations have since continued leading to numerous arrests. Most recently, almost 30 people were arrested during protests on Monday following the ruling. Mossett told IPS that if construction continues, there would only be more arrests of those protecting the river. Also among those arrested since the movement began have been media personnel. “The coverage of this issue is clearly a threat,” said Luger to IPS in response to media arrests. “[The government is] focused on media folks because they are terrified of this information getting out,” he continued. After filming and covering the incident with the dogs, Democracy Now! host and executive producer Amy Goodman was charged with criminal trespassing by North Dakota. “This is an unacceptable violation of freedom of the press,” Amy Goodman said in a statement. “I was doing my job by covering pipeline guards unleashing dogs and pepper spray on Native American protestors,” she continued. As winter quickly approaches, Native Americans and allies are bracing themselves for the long haul. “All of us are prepared to be at camp for as long as it takes,” Two Bulls told IPS. But this is not just their fight, she added. “Anybody that breathes air, lives on this land or drinks water—this is their fight too,” Two Bulls told IPS. “This is much larger than this pipeline…it’s about [deconstructing] this system and [creating] another system that works in the benefit of all people,” she continued. Luger echoed similar sentiments to IPS, stating: “This is not an indigenous movement, this is a human movement…if there is a leak in the river, half of the country has the potential of being tainted by this.” But they cannot stop this danger alone, he said. “I just hope that my children can go back to North Dakota and I can point out these geographical places and say this is our story, this is our history and we are from here. And look, that hill proves it,” Luger said.